Home / android / asus / launch / max / smartphone / zenfone / Asus ZenFone Max Pro 4GB variant, arrives in Manila at P13,995. Asus ZenFone Max Pro 4GB variant, arrives in Manila at P13,995. 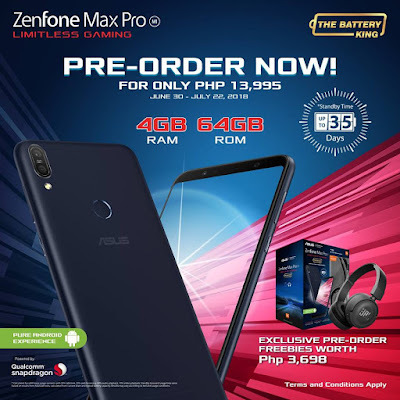 A huge announcement from Asus Philippines as they unveil the much awaited ZenFone Max Pro 4GB RAM variant during the “Max Pro: Game Zone” event recently held in SM City North Edsa Cyberzone Annex. ZenFone Philippines’ first-ever mobile gaming festival, in partnership with SM Cyberzone, was already met with loads of fanfare after joining forces with various international and local gaming developers, but the announcement of the arrival of this upgraded ZenFone Max Pro version was certainly the highlight of the event. The ZenFone Max Pro that was announced sports the long-awaited 4GB memory and 64GB storage, together with the powerful combination of a Qualcomm Snapdragon 636 processor, 5,000 mAh battery life, 18:9 FHD+ display is a unbeatable performance for a limitless gaming.